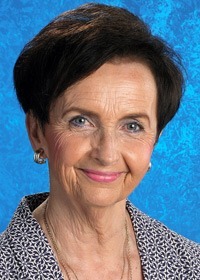 Alumna Pamela Nichols, principal of White Swan Elementary School in Rockford, has been named the 2014 Puri Family Outstanding Principal by the Golden Apple Foundation. In addition to the award, Nichols will receive $1,500 for her school and $500 in Volcano Falls gift certificates to reward excellent students, compliments of Sunil Puri of First Rockford Group. To celebrate excellence in education, Nichols is invited to the 18th annual Golden Apple Banquet on Friday, May 2, at the Radisson Hotel and Conference Center in Rockford. She has 14 years of experience in her field and has received four degrees from Northern: a doctorate in educational administration, an educational specialist degree, a master’s degree in educational administration and a master’s in early childhood education. She also has a bachelor’s degree in elementary education from the University of Wisconsin-Milwaukee.